For anyone looking to find some serenity surrounded by incredible nature, Gather Greene is waiting for you. 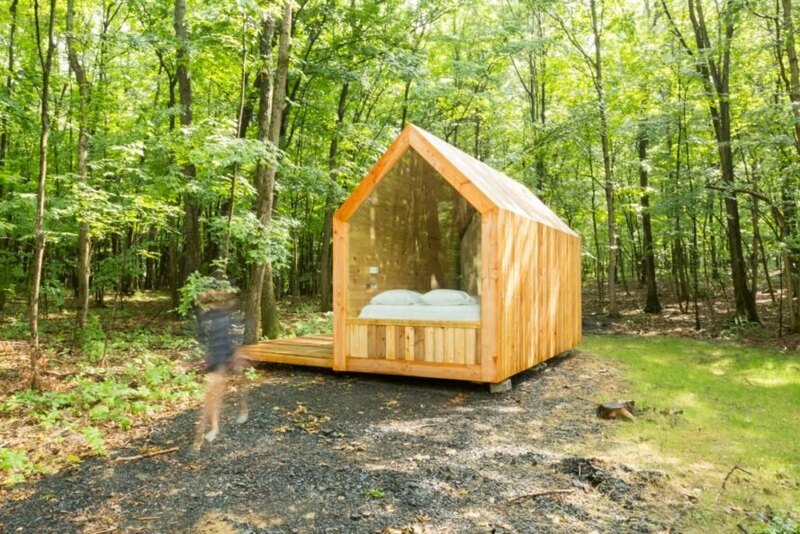 Located just two hours outside of NYC in beautiful Hudson Valley, Gather Greene is a glamping retreat featuring 17 minimalist cabins. The tiny cabins with gabled roofs and large glazed “picture walls” were designed to let guests immerse themselves in the idyllic surroundings. 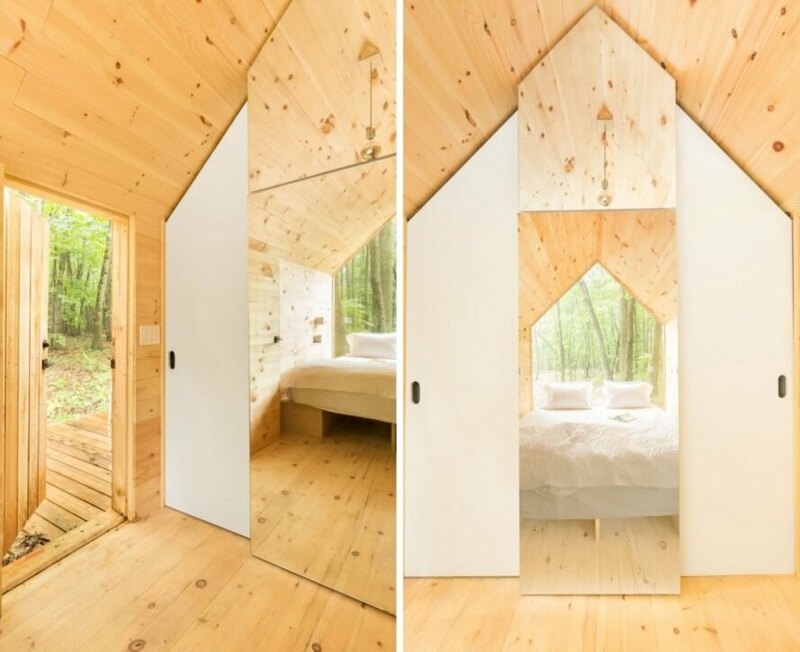 Located deep in a serene forestscape, the triangular tiny cabins are spaced in a way to both provide ultimate privacy and connect families and friends together. To make the most out of the nature-based escape, the glamping structures feature a gabled roof with a large front wall that is entirely glazed from top to bottom. The glass wall behind the bed was a strategic part of the design, enabling guests to enjoy their natural surroundings from the moment they wake up until they shut their eyes at night. Additionally, a mirror is mounted on the foot end of the bed, so that guests don’t have to strain their necks to enjoy the amazing views. Although quite compact, the glamping cabins are equipped with basic amenities to create a luxurious stay in nature. The cabins feature a space-saving interior design that provides maximum functionality with minimal space. For example, the interior includes a coffee and tea station that can be concealed into the walls, and the compact structures also have spa-like bathrooms. 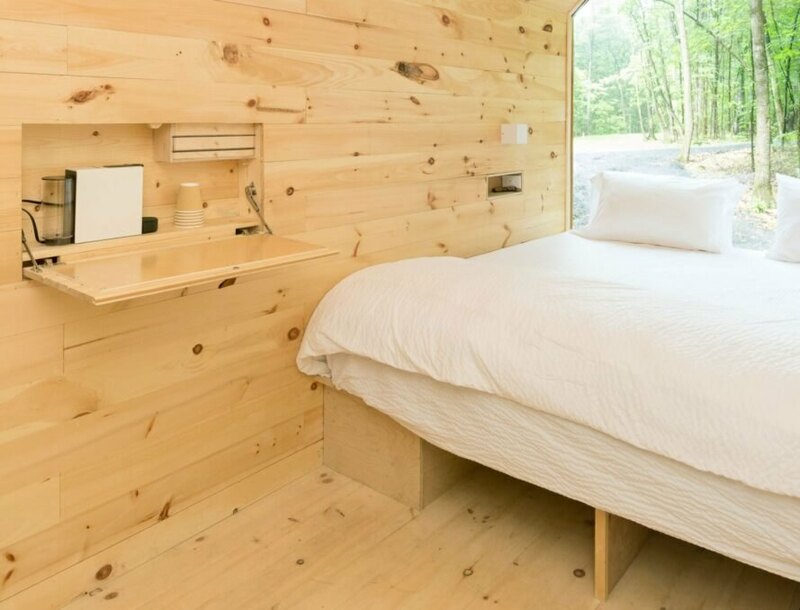 The tiny cabins, which sleep up to two guests, have fully-equipped bathrooms with stand-up showers. To completely immerse yourself into the location, the structures also have open-air decks that offer the perfect spot for dining al fresco or stargazing at night. 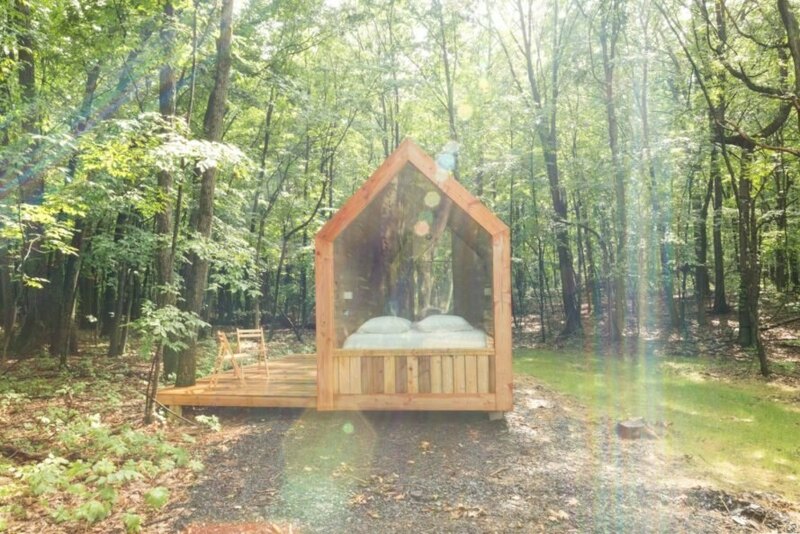 Gather Greene has unveiled a series of glamping cabins located in upstate New York. The distinctive wooden eco-cabins fit in well with their surroundings. 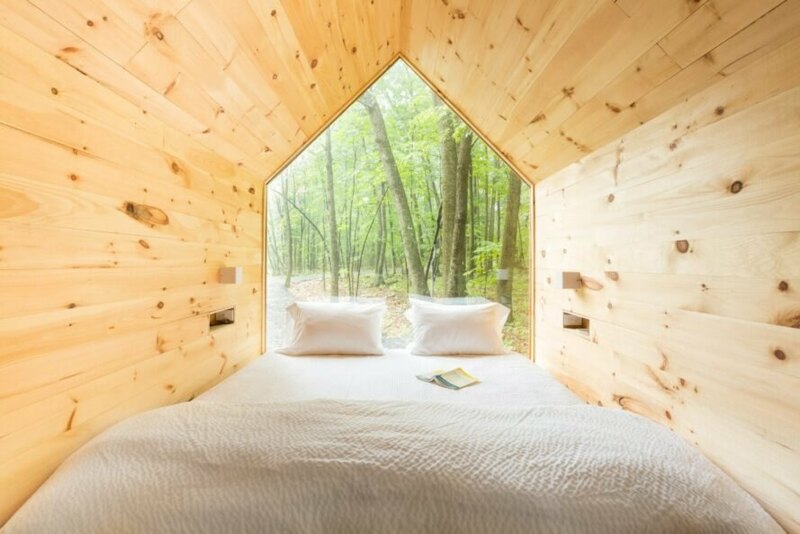 The tiny cabins have large glazed walls, so guests can fully immerse themselves in the surrounding nature. The cabins sleep up to two people. The interior of the cabin is outfitted with a concealed coffee and tea station. A large mirrored panel allows guests to enjoy the view from the bed. There is a fully-equipped en suite bathroom. The cabins also feature open-air decks for al fresco dining and stargazing.